When Rolls-Royce wants to create a customized one-off, it turns to Bespoke. This team of designers and craftspeople is routinely tasked with reimagining Rolls-Royce models to the exacting standards of individualized luxury, creating unique versions of some of the most lavish vehicles in the world. One of its latest inventions is this pearl white Phantom, dubbed the Serenity. 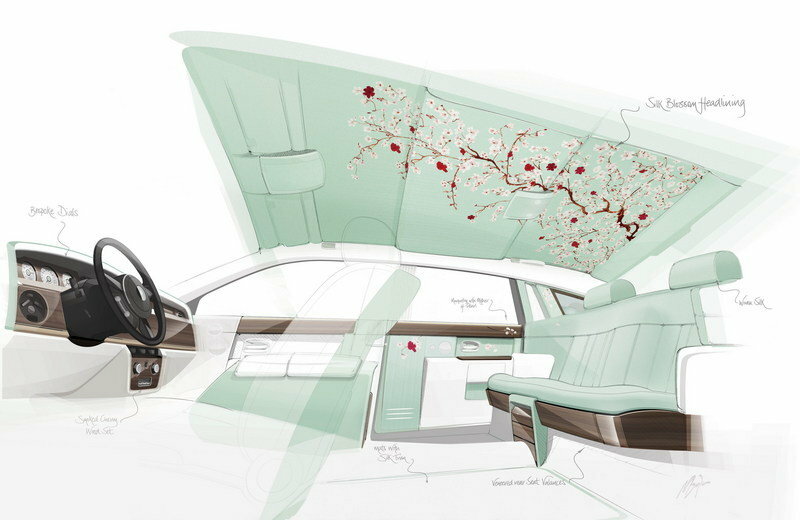 Bowing at the 2015 Geneva International Motor Show, the Serenity was created using inspiration from the “opulent interiors of Rolls-Royces that have conveyed Kings and Queens, Emperors and Empresses and world leaders.” Combining contemporary furniture design with Japanese Royal robe motifs, the Serenity seeks to form a cocoon of tranquility similar to a private garden. To up the luxury ante, Rolls-Royce reintroduced the use of silk for the cabin, a material which it uses extensively as a way of revisiting the interiors in the Rolls-Royces of the early 1900s. 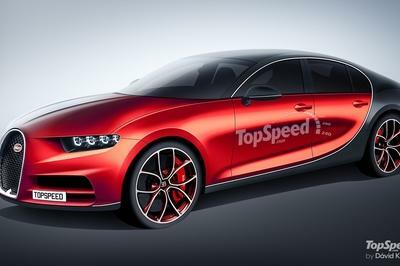 The exterior has also been altered to reflect the extensive interior redesign. Rolls-Royce is presenting this unique Phantom as a demonstration of wealth and good taste that goes above and beyond the factory model. Read on to see how Bespoke sought to achieve such lofty status. 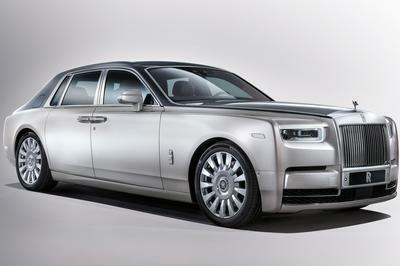 Updated 03/03/2015: Rolls Royce unveiled the new Phantom Serenity at the 2015 Geneva Motor Show. 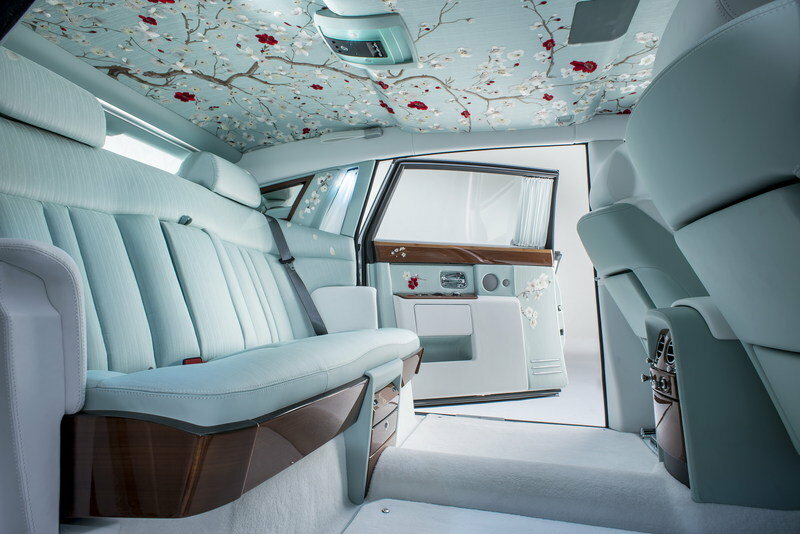 Continue reading to learn more about the 2015 Rolls-Royce Phantom Serenity. The Serenity started life as a regular plain-Jane Phantom sedan (if there ever was such a thing), with the distinctive squared front grille and headlights, long hood line, and high beltline. Rolls says the Phantom was the obvious choice for this project, probably thanks to its enormous popularity and extended catalogue of special editions. To this blank canvas, Bespoke added one of the most expensive one-off paint jobs ever developed by Rolls-Royce Motor Cars. It’s called “Mother of Pearl,” and it was laid down on the exterior body panels in a three-stage process to provide it with the desired richness and depth. Then, craftspeople at the Rolls-Royce headquarters in Goodwood hand-polished the paint for 12 hours to bring it a high level of luster. Throughout history, China has been famous for its silk production, and thus, the Bespoke team sourced the delicate textile from Suzhou, a town renowned for imperial embroidery. The unspun silk thread was hand-dyed by Chinese craftspeople before being handed over to the Bespoke team. The material was then sent to Essex to be hand-woven into 10 meters of fabric, a process that took two days to complete. The final result has 140 threads per centimeter and is presented in a “Smoke Green” color. The blossom motif, a design created by Haye and Lusby, using copper-colored branches and white petals, was then applied. The final details of each crimson blossom petal were then hand-painted directly onto the silk. In total, up to 600 hours of work went into each interior panel. However, the Serenity uses more than just silk for its interior. Encouraged by modern furniture design, the rear seating area is complemented by valances made from rare Smoked Cherrywood, while the front seats are upholstered in Artic White Leather. The Smoked Cherrywood is used in the door cappings, the dash fascia, and rear center console. Bamboo is also applied. 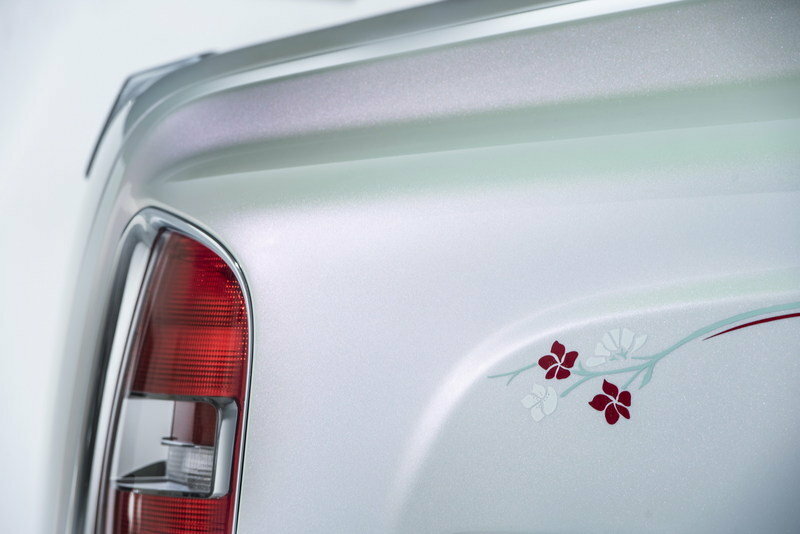 The blossom motif continues in the marquetry of the rear door cappings using calcium carbonate mother of pearl, which is laser-cut and hand-applied petal by petal into the wood. Mother of pearl is also used in the clock and driver’s gauges, where concentric circles and inlaid rubies continue the color scheme. Finally, the luggage compartment is also lined in Arctic White Leather with Arctic White carpet, as two parasols held by leather loops are incorporated into the trunk lid. Given the fact that anyone who would consider a vehicle as over the top as the Serenity would certainly have a chauffeur to sit at the helm, the drivetrain remains completely unaltered. 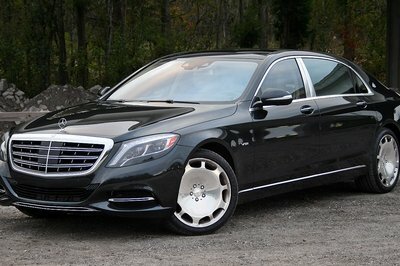 That means that underneath all the blossoms and organic design thumps a twin-turbo, 6.7-liter V-12. Output is 453 horsepower and 531 pound-feet of torque, delivered to the ground through an eight-speed automatic transmission. That kind of grunt is absolutely necessary in a car that weighs 5,840 pounds, and as such, the hired driver will be able to get up to 60 mph in 5.7 seconds. Not that such velocity is necessary when meditating in the back seat. If I were to take a stab at guessing the outlay required for this one-off work of art, I’d say it took an extra $120,000 to complete the project. Tack on the Phantom’s $474,990 base price, and you’re looking at around $600,000. But who’s counting? When talking about the Rolls Royce Phantom, there is only one car I can think of as a competitor: the Mulsanne. 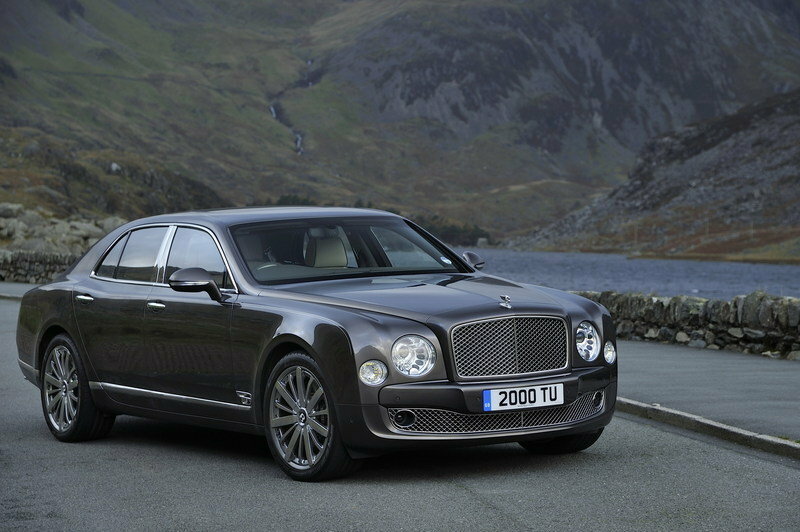 Though it is slightly smaller and lighter on its feet than the Phantom, the Mulsanne is no stranger to high rollers. With a 6.75-liter twin-turbo V-8 under its hood, the Bentley rolls in with 530 horsepower and 811 pound-feet of sledgehammer torque. This massive power is enough to defy physics and get this land barge to 60 mph in just 4.8 seconds. 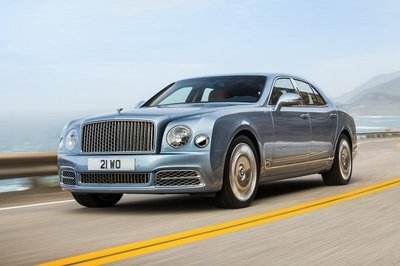 In terms of features, the Mulsanne cannot compete with this one-off Rolls, but it does well with loads of premium materials, and all the goodies any businessman or dictator could ever need. And if it isn’t there, I am sure Bentley can install it for a fee. With cars like the Serenity, Rolls-Royce and Bespoke are making a throwback to the days of coach building, when customers would purchase an engine and chassis and send it off for a completely customized vehicle. Interestingly, this seems to be a highly desirable arrangement amongst the world’s wealthiest, with one-off commissions and Bespoke Collections sales growing by 31 percent last year. In fact, 85 percent of all Rolls-Royce cars sold worldwide in 2014 were commissioned with some level of Bespoke content. The Serenity is a beautiful display piece of that commitment to quality customization. Everything feels special, handcrafted, and expertly executed. As a form of artistic expression, the car is fantastic, but leaves the question of whether something functional like a Phantom can every truly be art. For this particular reviewer, all that’s needed to answer that in the affirmative is one look at the pearl inlays and painted blossom pedals. Rolls-Royce Motor Cars has brought Serenity to this year’s Geneva International Motor Show, unveiling the new standard in authentic, bespoke luxury motoring to the world’s media. Sir Henry Royce’s maxim, “When it does not exist, design it,” inspired the latest generation of Rolls-Royce’s Bespoke designers to ask what wholly new approach to luxury would delight the most demanding and exacting people in the world – Rolls-Royce customers. Their answer came from Rolls-Royce’s deep understanding of the most precious, beautiful and natural materials. Silk would prove to be the route to a new definition of luxury, one that guarantees every customer a canvas for completely unique design, every time. The marque’s Bespoke Design team took inspiration from the opulent interiors of Rolls-Royces that have conveyed Kings and Queens, Emperors and Empresses and world leaders. 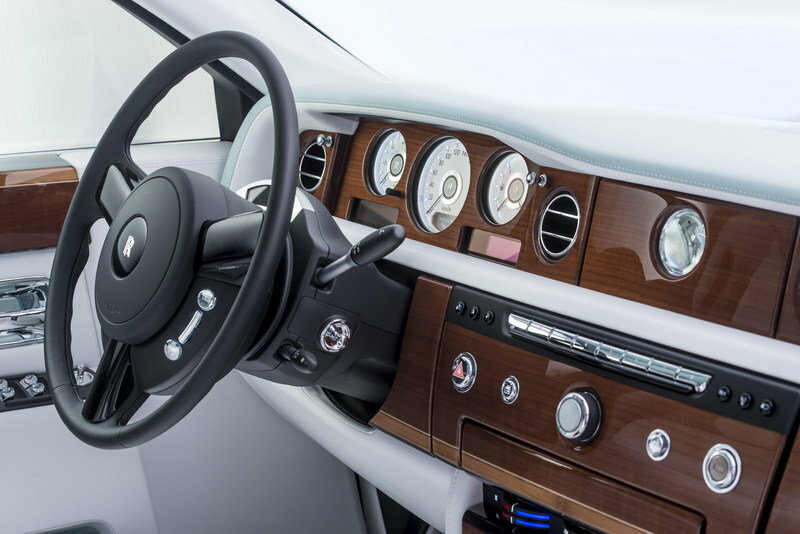 Add to this, contemporary interpretations of furniture design combined with Japanese Royal robe motifs and Rolls-Royce designers have delivered a truly innovative, thoroughly modern and tranquil Rolls-Royce interior. Delivering authentic modern luxury, Serenity reintroduces the finest of textiles – silk – to create the most opulent interior of any luxury car. This unique design demonstrates the levels of craftsmanship, creativity and attention to detail only Rolls-Royce Motor Cars can offer. More than ever, Bespoke is Rolls-Royce. “Having revisited the history of the amazing interiors of the elite Rolls-Royce’s of the early 1900’s, we felt inspired to share this heritage with our new customers in a very contemporary way,” comments Giles Taylor, Director of Design at Rolls-Royce Motor Cars. The choice of Phantom for this project was obvious, but creating the motif that would define this most opulent and modern of automotive interiors would require considerable new expertise. 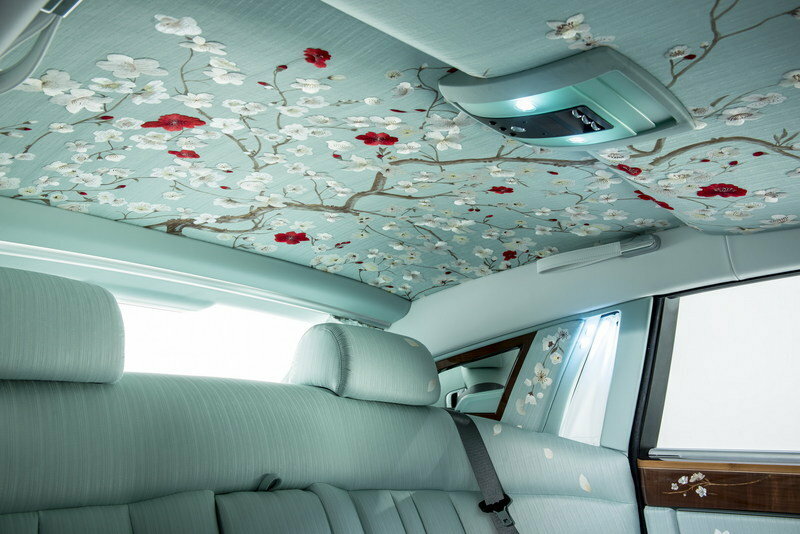 Cherica Haye and Michelle Lusby, both Textile Arts graduates from the Royal College of Art and Plymouth University respectively, joined Rolls-Royce’s Bespoke Design department to help realise the direction of the core motif for this magnificent one-off Phantom. “Some of the most opulent silk motifs come to us from the Orient, where imperial families’ and rich merchants’ robes were made from the finest silk materials,” comments Lusby. The ultimate example of the most opulent robe design became the junihitoe, a highly complex handmade ‘twelve-layer robe’ of silk worn only by female Japanese courtiers. The colours and the arrangements of the layers were very important, with the colours given poetic names such as ‘crimson plum of the spring’. In addition, during the Japanese Edo period (1615-1868), the merchant and artisan classes commissioned beautiful clothes to demonstrate their wealth and good taste. Clothing developed into a highly expressive means of personal display, an important indicator of rising affluence and aesthetic sensibility. A new aesthetic known as iki, or elegant chic, meant anyone with real taste focussed on subtle details, whilst those with style and money found ways to circumvent rules that forbade the use of certain colours, such as red, by applying them to undergarments and linings. As with the creation of every Rolls-Royce, the genesis of Serenity and its blossom motif began with a blank piece of paper. However, unlike any other Rolls-Royce, it also began with a blank bolt of the finest hand-woven silk. In order to create this totally one-off bolt of silk for Serenity, the Bespoke team looked to Suzhou, China, the town renowned for its creation of imperial embroidery. The team sourced the unspun silk thread and had it hand-dyed by the Chinese craftspeople who have been creating beautiful silks for centuries. It was then transported to one of Britain’s oldest mills, based in Essex, to be hand-woven into just 10 metres of the fabric – enough to clothe the interior of Serenity – in a process that took two days or two hours per meter of fabric. The numerous colours of silk thread were painstakingly blended into the highest quality warp which has 140 threads per centimetre to result in the lustrous Smoke Green colour of the underlying silk fabric. Once prepared, the plain Smoke Green silk was transferred to London where the blossom motif designed by Haye and Lusby – a uniquely modern take on centuries-old silk Chinoiserie – began to flourish across the fabric as British and Chinese craftspeople embroidered their vision of copper-coloured branches and white petals. The final touch was the detailed petal by petal hand-painting of crimson blossoms directly onto the silk. The resulting panels and swatches that have formed the centrepiece of Serenity would take up to 600 hours of work per panel. The style of painting employed in the design of the Serenity silk is a centuries-old technique known as ’unconscious painting’. Much of Japanese painting technique is learned through very fine and detailed rendering of classical forms within nature; branches, leaves, flowers, bamboo etc. The work can be painstaking with the same form rendered again and again. The purpose of this repetition is to imbue in the artist an innate understanding of these natural forms until their balance and nature is understood without thought. In order to paint a calm and beautiful image the artist must be calm of mind. Mood becomes all important as it will influence the balance and mood of the work. A meditative state results where the brush can flow freely in the artist’s hand – a state of ‘unconscious painting’. So in preparing to paint the panels for Serenity, the serene state of mind was all important. The branches needed to have life, movement, spontaneity – but with grace and calm. As discerning customers in the early 1900’s moved from horse drawn carriage to motor car, the style for many of their luxury automobiles was the Sedanca de Ville. With open cockpits, chauffeurs continued to sit on leather, a naturally robust material suited to exposure to the elements. However, luxurious fabrics remained the upholstery of choice for the occupants of the rear compartment. Only when automotive leather became more refined was it accepted by patrons of the prestigious marques as a luxury material. At the same time the increasing availability of artificial fabrics to the wider car industry meant that leather was seen as a luxury, and the best leather, the ultimate luxury. Today, only the finest hides make it into a Rolls-Royce motor car. Of course, the creation of the most opulent interior of any luxury car could not simply rely on beautiful silk upholstery. Taking its cue from the world of modern furniture design, the rear occupants’ elevated and powerful seating position has been accentuated with the valances of the seats made from rare Smoked Cherrywood. Reminding one of the drivers’ position in the early 1900’s motor car, the seats in the front of the car are clothed in Arctic White leather. Smoked Cherrywood continues the Oriental theme within the cabin, applied the Serenity’s door cappings, dash fascia and rear centre console, but further embellished by another beautiful Far-Eastern wood – Bamboo – with the highly skilled application of Bamboo cross-banding. In addition, the blossom motif from the silk is recreated through the finest marquetry on the rear door cappings through the use of Mother of Pearl, which is laser-cut and hand-applied, petal by petal into the wood. Mother of Pearl is created when two substances, one mineral and the other organic, combine. Tiny hexagonal plates of aragonite, a form of calcium carbonate, are arranged in layers alternating with conchiolin, a flexible protein similar to silk that is secreted by the mollusk. 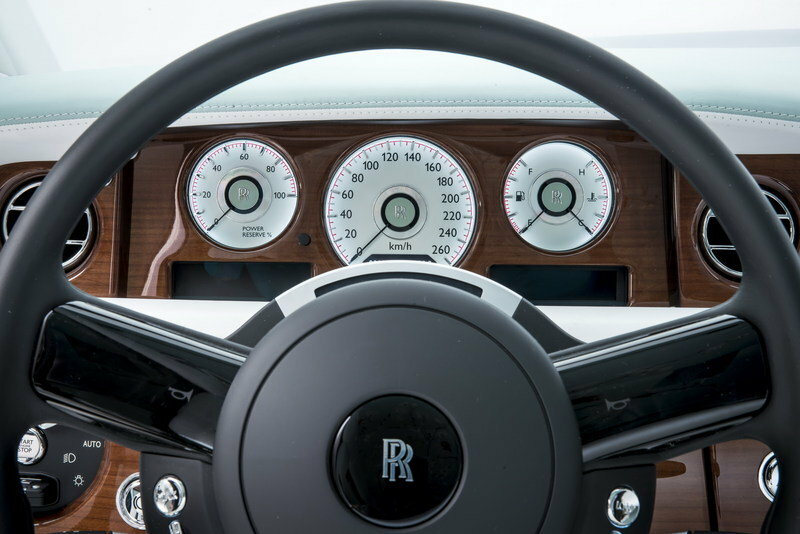 This theme is continued in the driver’s compartment of the car with Mother of Pearl applied to the face of Bespoke Serenity’s clock and the driver’s instrument dials. This Mother of Pearl face is etched with concentric circles redolent of the raked gravel seen in Japanese gardens, and is inlaid with hand-applied rubies which echo the colour of the hand-painted flowers in the silk lining. Continuing the theme of ultimate luxury, the luggage compartment of Serenity is lined in Arctic White leather with an Arctic White carpet. As a final touch, two parasols featuring the Serenity motif are held by Bespoke leather loops incorporated into the boot lid. The lustre of Phantom Serenity’s exterior dazzles with its powerful and noble presence. 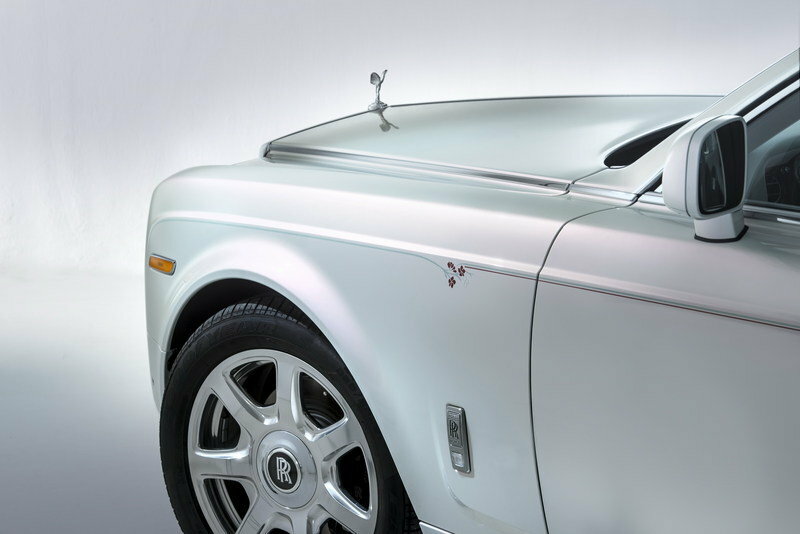 Its Bespoke Mother of Pearl paint is the most expensive one-off paint ever developed by Rolls-Royce Motor Cars. It has been added in a three stage pearl effect and hand-polished for 12 hours by the craftspeople at the Home of Rolls-Royce at Goodwood to deliver this shimmering presence. 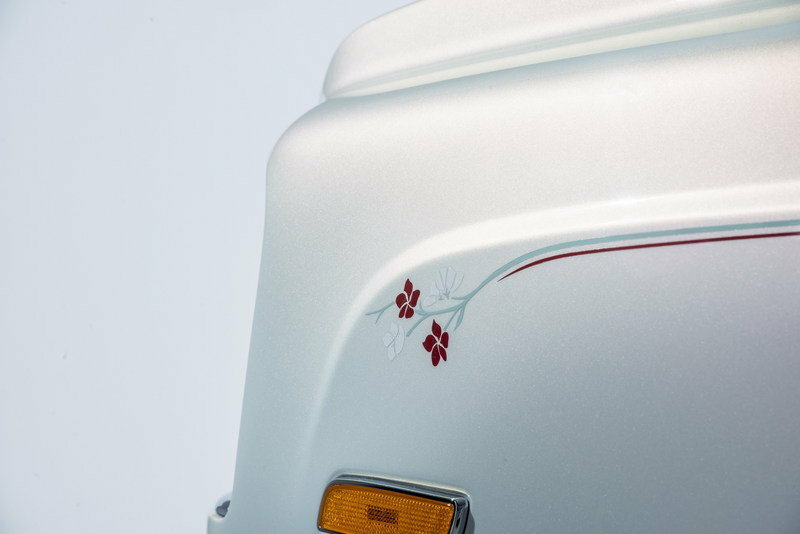 Hinting at what is to come, a delicate two colour coachline with three colour blossom motif echoes the interior. 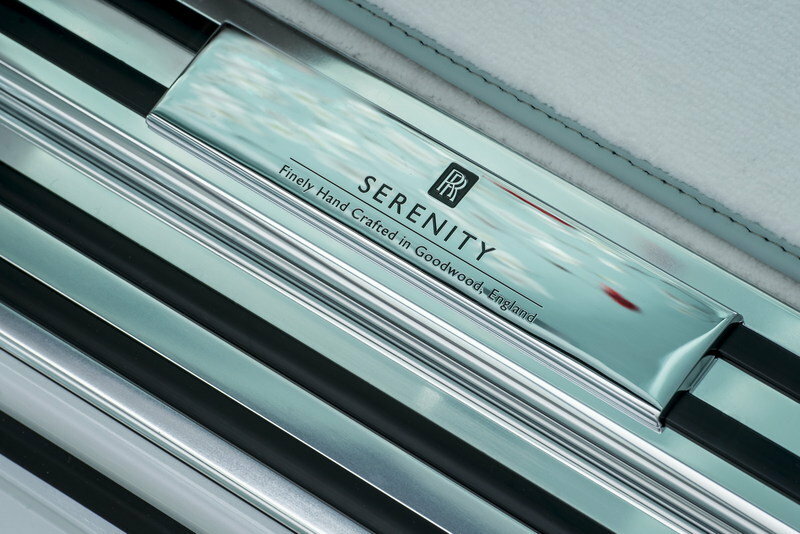 The coachline that adorns Serenity’s exterior has been applied by the squirrel-hair brush of the Rolls-Royce Motor Cars coachline expert, Mark Court. 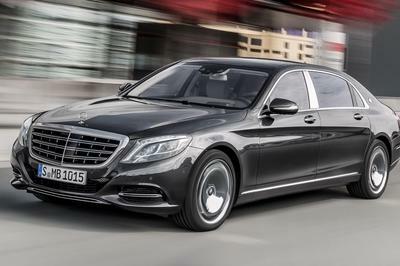 The asymmetric nature of the coachline signifies the respective positions of owner and chauffeur, with the entrance to the rear compartment indicated on the right-hand side of the car with the blossom on the rear wing and coachline ending at the B-pillar. Phantom Serenity is the latest one-off commission to come from the Bespoke team at Rolls-Royce Motor Cars. One-off commissions and Bespoke Collections helped Bespoke sales to grow globally by 31% in 2014, with 85% of all Rolls-Royce motor cars sold around the world commissioned with some level of Bespoke content. Whilst every Rolls-Royce is special, nearly every customer desires extraordinary distinguishing features to make their car completely unique. Fulfilling these requests falls to the marque’s Bespoke design department; a collective of the automotive world’s finest designers, engineers and craftspeople. This approach has distinguished Rolls-Royce Motor Cars for over a century, with today’s methods echoing the age of the coachbuilder when customers purchased their chassis and engine before sending it away to be bodied to their exacting specifications. From the finest detailing to the boldest statement, customers work in close collaboration with the team to realise their desires. Inspiration can come from anywhere; whether it is a request to perfectly match the exterior finish to a favourite garment or a more elaborate creation that seeks to tell a story, no idea is left unexplored. With an unparalleled scope for personalisation, Bespoke is very much the jewel in the crown of Rolls-Royce Motor Cars’ unique brand promise. Indeed, Bespoke is Rolls-Royce.